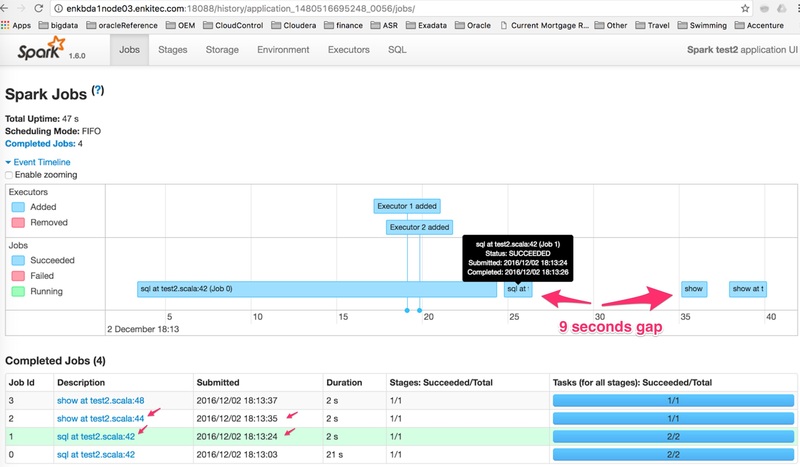 Sometime ago one of my clients asked me a question when reviewing a Spark job: why there is a time gap in the event timeline, sometimes can be as long as one minute. If there are a few seconds, it seems make sense it could relate to Spark’s overhead between each job run. But for one minute, it seem to be too long for any overhead activities because the whole job takes only 8~9 minutes. I didn’t have a good answer for the question. 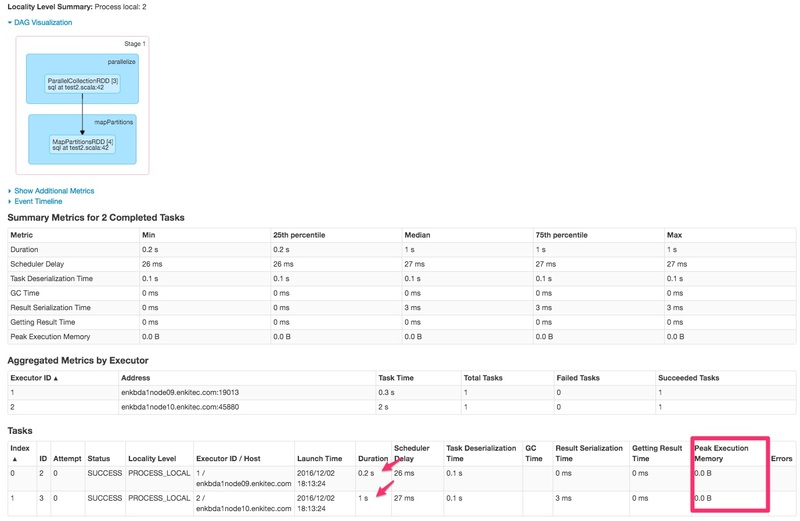 Recently I did some benchmark for a spark job on a X3 full rack Oracle BDA in our lab, I did notice the same behavior. I tracked down the issue and finally figured out the cause of the timeline gap. I am going to share my findings in this blog. Line 42 is pulling all data from wzdb.sales_part table, which is a hive partition table using Parquet and SNAPPY compression. The table has about 1.3 billion rows and 1,680 partitions. Line 44 just show the DataFrame myDF, by default it shows 20 rows. Similarly line 47 pull 100 rows from wzdb.sales_raw table and line 48 show the first 20 rows from the table. Ok, the code can not be simpler than that. After started the spark job, it finished in 40 seconds. However, when I checked out the Event Timeline, it shows there is a time gap between Job (or stage) Id 1 and Job Id 2. Job Id 1 started at 18:13:24 and completed at 18:13:26. But the Job Id 2 started at 18:13:35 and there was 9 seconds time gap, about 25% of total execution time. 25% seems a lot to me. Job Id 1 executed the line 42 while Job Id 2 executed the line 44. There is no execution code at line 43. Things become interesting. Then I checked out Executors page. It shows there are two Executors and each took about 6~7 seconds tasks time. Then I click the link to stdout Logs for each executor. I paid more attention to the timeline between 18:13:24 and 18:13:35. 16/12/02 18:13:19 INFO util.Utils: Successfully started service 'sparkExecutorActorSystem' on port 38184. 16/12/02 18:13:19 INFO util.Utils: Successfully started service 'org.apache.spark.network.netty.NettyBlockTransferService' on port 45880. 16/12/02 18:13:19 INFO storage.BlockManager: Registering executor with local external shuffle service. 16/12/02 18:13:40 WARN executor.CoarseGrainedExecutorBackend: An unknown (enkbda1node05.enkitec.com:33339) driver disconnected. 16/12/02 18:13:40 ERROR executor.CoarseGrainedExecutorBackend: Driver 192.168.12.105:33339 disassociated! Shutting down. Executor 1 handled 840 Hive partitions. There are no additional logging information between 18:13:26 and 18:13:35. The log immediately jumped from 16/12/02 18:13:26 INFO executor.Executor: Finished task 1.0 in stage 1.0 (TID 3). 1503 bytes result sent to driver to line 16/12/02 18:13:35 INFO executor.CoarseGrainedExecutorBackend: Got assigned task 4. It did not tell me anything useful. Ok, let me check out the Stages page. I am more interested in Stage Id 2 and Stage Id 3. Here is the screen for Stages summary. Let’s check out Stage Id 1 screen shown below. The duration is only between 0.2 and 1 seconds for the two executors. Another interesting statistics is the Peak Execution Memory is 0 Byte for both. I don’t believe this stage can load 1.3 billion rows of data without any memory usage. In other words, I believe it does not do any IO related work at this stage although the stage is doing select * from wzdb.sales_part. Ok, let me check out the next stage, Stage 2. The DAG chart is so huge that it takes 20 seconds to shows up on the screen. There are literally 3,365 RDD partitions with union operation together to provide the result for show() function. The Metrics stats for this stage gives other interesting result. The total duration is unbelievable fast, 1 second and input size of 1980KB and 21 records. Remember, by default, show() function just print out 20 rows. So this 1980KB and 21 records are definitely related to this 20 rows show() result. But with 3,365 RDD partitions are union together, 1 second seems unbelievable fast. Please note the block size is 256 MB in our environment. I just don’t believe it’s physically possible to perform stage 1 operation (select * from wzdb.sales_part with 1.3 billion rows Hive Piquet table) in 1 second and immediately show 20 rows of result in the following 1 second. Yes, Spark is in memory based processing and super fast. But from the DAG, it go through all 1.3 billion rows. It can’t be finished in 2 seconds, even with a full rack BDA. It must has something else not present in the picture. Luckily, for this test, I used the client mode as the deployment mode. So all of the log output was sent to my driver, the executing session. Then I found out where the missing time goes. 16/12/02 18:13:26 INFO datasources.DataSourceStrategy: Selected 1680 partitions out of 1680, pruned 0.0% partitions. 16/12/02 18:13:36 INFO datasources.DataSourceStrategy: Selected 1680 partitions out of 1680, pruned 0.0% partitions. The above log shows that IO operations like parquet.ParquetRelation: Reading Parquet file(s) are completely outside the timeline for Job(/stage) 1 and Job 2. This is where the missing time goes. It is actually pretty good to have only 9~10 seconds to go through the all 1.3 billion rows. Mystery is solved. With the above findings in mind, I feel if I just do partition pruning and limit the number of rows scanned in the line 42 query, the gap timeline should be reduced as less IO is needed to read the data. So I add the partition pruning in the query on line 42 to select * from wzdb.sales_part where year=2013 and month=11 and day=13. Rerun the test. The result was exactly what I expected. As you can see, there is only 1 second gap between Job Id 1 and Job Id 2. Here are the execution log. Only one partition of data was read. 16/12/03 11:11:11 INFO datasources.DataSourceStrategy: Selected 1 partitions out of 1680, pruned 99.94047619047619% partitions. Lesson learned from this test is that Spark Metrics is helpful to identify the bottleneck of the spark application, but may not tell you the complete story. Just like in this case, if we just focus on the 1 or 2 seconds operations, it seems nothing need to be tuned here. On the contrary, we should need to focus on reducing the IO to access 1+ billion rows table by adding filter of partition keys and limiting total number of rows scan.